The Syracuse Men’s lacrosse team will open their 2019 season at home this Friday, February 8 against Colgate University. The Orange, currently ranked number 11, finished last year’s season 8-7 with a disappointing loss against their Upstate rival Cornell in the first round of the NCAA Tournament. Although the Orange played well enough to go undefeated in ACC games last season, their non conference game lacked depth, which cut postseason play short. As part of Inside Lacrosse’s 2018 Face-Off Yearbook, three Syracuse players were named to their Preseason All-Americans list. Defender Nick Mellen was named to the second team as a defenseman. Longstick midfielder Brett Kennedy and junior midfielder Jamie Trimboli made the honorable mentions. Tune into 88.3 FM WAER at 6:30 for Countdown to Faceoff. Although the Orange finished their 2018 season in a lose to Cornell, they hope this season is more promising especially having eight returning starters.The team also brings back its entire defense and first-line midfield, three of their four attacks and their primary faceoff player. Relying on previous experience will be something the Orange have to their advantage, but they have to bring their ACC supremacy to non conference games. Going into this season, the Orange are looking to strengthen their defense. Coach Desko attributes the poor defensive end to the mumps outbreak last fall that took a toll of practice time and scrimmages. 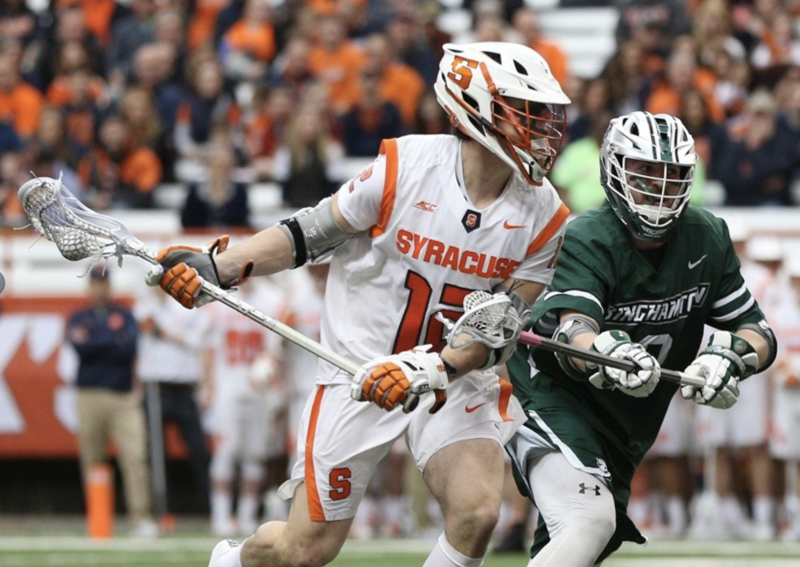 However, with Mellen back for his third season and named one of the top defenders in the ACC, the Orange hope to gain back confidence as a top lacrosse team. The Syracuse Orange hope to have another season opening victory on Friday. Last year they hosted Binghamton and won. The Orange are going into the game against Colgate with confidence as Syracuse leads the all-time series 48-11-1. They also have a superior victory record of 80-19 in season opening games. Syracuse ended their regular season play against the Raiders last season in a blow out victory beating them 17-5. The notable and top scoring players of that game, Jamie Trimboli and Nate Solomon are back again this season ready to dominate Colgate again. Because the Raiders didn’t make it to any games in the postseason including the NCAA Tournaments, their season ended last year in the Dome. The last time Syracuse played Colgate in a season opener was in 2001, where the Orange defeated the Raiders 12-5. For the past few seasons, the Orange have played the Raiders at the end of the season after the ACC Tournament. But this year with the structure of the tournament being changed, the Orange will hopefully kick off the season with a great win. Faceoff will be at 7:00 at the Dome.